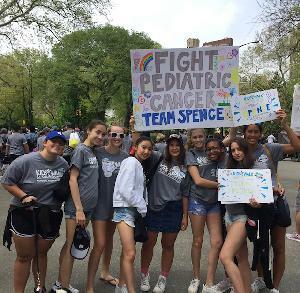 The Spence School is raising money towards fighting all pediatric cancers!!! Please join us by registering to our team and walking with us May 4th, or by making a donation! 100% of the money donated to Kids Walk goes directly to the Department of Pediatrics at Memorial Sloan Kettering Cancer Center — where more kids with cancer are treated than any other hospital in the United States. Only 4% of the National Cancer Institute’s budget for research goes towards pediatric cancer. About 60% of all funding for drug development in adult cancers comes from pharmaceutical companies, but for kids? Almost none, because childhood cancer drugs are far less profitable. Pediatric cancer research is extremely underfunded. Far too many children still lose their lives to cancer. For the ones that make it, many suffer through medical complications caused by invasive treatments for the rest of their lives. But there's still hope. The money you give and raise supports new and better treatment options for children around the world. Together, we can make a difference! Thank YOU!